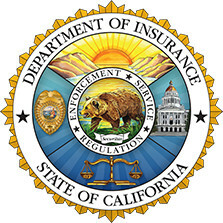 Insurers don’t have to use the sample auto body labor rate survey template enshrined into state regulation Thursday, but they need some sort of documentation supporting whatever amount they argue is the prevailing rate, a California Department of Insurance official said Friday. Otherwise, carriers could have a hard time justifying to regulators a refusal to pay a collision repairer’s hourly rate after the Feb. 28, 2017, deadline to comply, Tony Cignarale, CDI deputy commissioner for consumer services and market conduct, said in an interview Friday. “It wouldn’t change the requirement to support how much it pays,” Cignarale said of an insurer which opted not to do any sort of survey. Cignarale said the insurers could even try and use their older surveys as the documentation validating what the carrier says is the market rate. However, Democratic Commissioner Dave Jones’ administration developed the new regulations after finding serious flaws in past insurer methodology — which would suggest that following Feb. 28, the old survey data might not fly with CDI regulators as easily. While insurers could use other means to derive the rate, they’d still face varying degrees of regulatory risk. “Does it result in fair labor rates in those geographic areas?” Cignarale described the state’s scrutiny. Insurers send a survey to all paint and body shops with Bureau of Automotive Repair licenses and which meet other equipment and insurance guidelines. The shop fills out their rates for a variety of substrates and repairs — the rate they’d charge an out-of-pocket customer, not a discounted direct repair program rate. The shop indicates whether they are a direct repair program shop or not to help the state audit any funny business on Step 2. The shop signs it and sends it back to the state. Insurers can adjust the results for inflation to minimize surveying demands, but no data can be older than 28 months. Shops aren’t required to fill out the study, but it’s in their interest to do so. 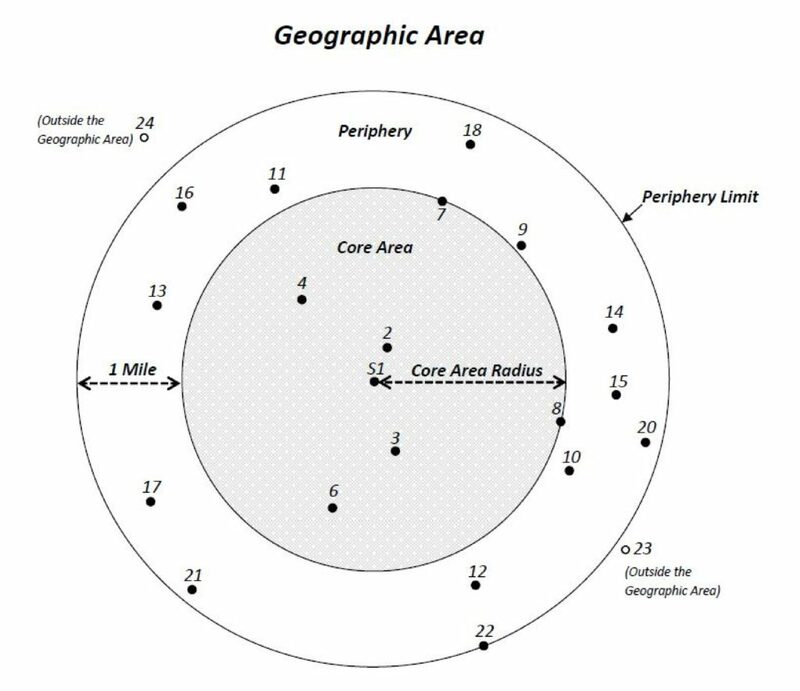 They also propose a market area of the nearest geographic six shops which completed the survey, counting the shop the insurer’s customer is using itself if it completed the document, and all other shops within a region extending out a mile from the farthest of the six shops. So the fewer shops in a market fill out the survey, the less accurate a prevailing rate will be. Asked about “get-out-the-vote” efforts from the CDI, Cignarale pointed to the news release Dec. 1. Trade groups might be a major force encouraging participation, Cignarale suggested; the California Autobody Association, for example, has been a big proponent of the measure. “Most of the shop world is pretty dialed in to this,” Cignarale said. After all, in a perfect world where every qualified shop fills out every survey completely and accurately, you’d only need a single survey every 28 months. Any subsequent poll answered along these perfect-world lines would just yield the same results and be redundant. Insurers choosing to use a competitor’s findings or pay a third party for data should be aware that the state will treat it as though the carrier produced the results themselves, according to Cignarale. “They’re gonna be held liable for the results,” he said. This does raise the possibility of a “dueling survey” complication, where Insurer X and Y both conduct surveys but for whatever reason, Insurer Y gets better participation — and therefore a different prevailing rate for the same market. In a vacuum, the state would probably look at the one best pertaining to the claim itself, Cignarale said. He said the state might also look at some of the shop identifying information visible only to the state, not the public, for such determinations and other audits. Would the state merge two surveys to fill in each other’s gaps? Cignarale said the CDI really wasn’t moving in that direction. Instead, it would probably work with an insurer whose data is lacking to achieve a better data set the next time, he said. As mentioned above, some identifying information — including individual locations’ specific rates — will be withheld from the public, visible only to the CDI. The state will make the remaining prevailing rate data and other information publicly available so a shop or customer can make sure the insurer is accurately representing the market rate. “Down the road,” the state is considering posting this online to avoid the inconvenience of Californians having to file a public records request to see it, Cignarale said. 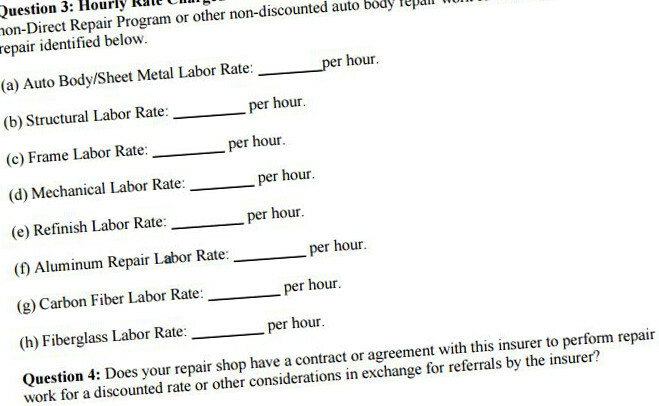 This public information should allow a shop or customer to see that the prevailing rate for a hypothetical Joe’s Body Shop’s was $38 an hour and get a list of the six shops used to determine that rate, according to Cignarale. He said Joe could then review this information and argue to the state, “there’s no way that these shops charge 38 dollars an hour.” The CDI would then audit the results by using the sealed complete survey records. The state could also refer to the sealed records to audit other parts of the results, such as whether DRP shops surveyed incorrectly answered with discounted DRP labor rates instead of their actual door rates. The initial version of the regulation did make all these posted rates public as well, and we were curious why the final version removed this information. Weren’t shops by definition making this information public the first time they send someone an invoice? Cignarale explained that California actually doesn’t require auto body shops to post a rate at all. “99 percent of them do,” he said, but as the CDI doesn’t have statutory authority over shops — only insurers — it can’t compel the other 1 percent to post a rate. Therefore, it couldn’t publicize what they individually did report. That doesn’t mean a shop can just completely wing it every time or pretend their rate is a million jillion dollars. Insurers can rely on invoices to show the state what the shop’s actually charging and act accordingly, Cignarale said. “It (the regulation) does have a caveat for that,” he said. As some of our hypotheticals and discussions with Cignarale indicate, regulations can be messy when they actually are applied in the field. But it appears that California has hit upon a pretty elegant solution to the issue of finding a market rate that’s fair to insurers, shops and customers. Repairers should do their part to help make it work by comprehensively and honestly filling out every survey they receive. “We think we came down in a good spot here,” Cignarale said.